What happens when a boring chain store pulls out of a town and leaves a vacuum? When you're in Key West you get a one of a kind gem known as Fast Buck Freddie's. 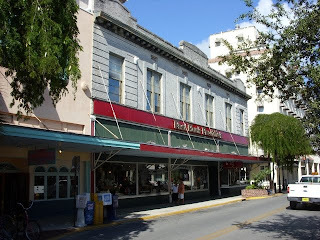 The place used to be a Kresge's and when the city of Key West lost its way due to the Cuban Revolution cutting off trade and travel down there, business dried up and the Kresge's closed. Fast forward a few years later and the place was opened up by a person with some creative intelligence and some truly interesting buyers getting a one of a kind assortment of merchandise that is worth a look. The link on Google Maps Street View shows the front window in better detail but frankly neither picture does the window justice. This is one of the most creative window displays I have ever seen and that is true every time I go there. If you are in town, skip the shell shops and the other tourist traps and go to Fast Buck Freddie's, its always entertaining and you may go home with something truly worth your time and effort. Tropical Paradise or just another Weird Cemetery?